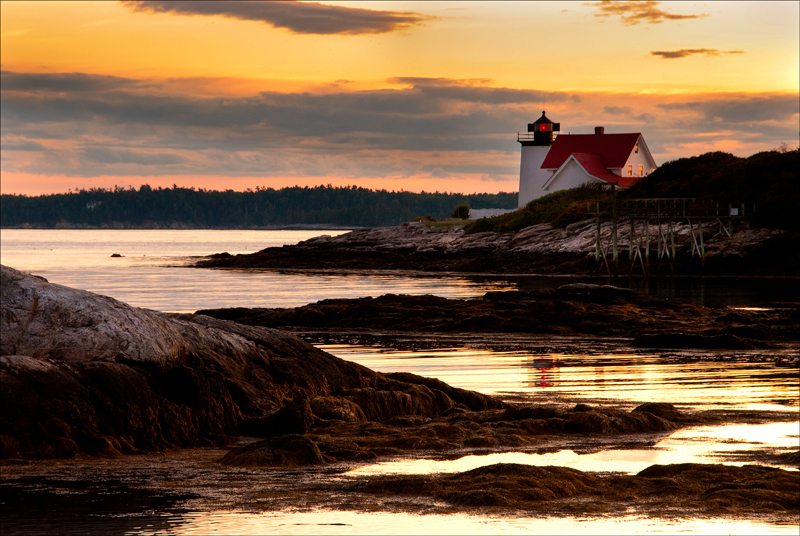 Sun setting by Hendrick’s Head light near Boothbay Harbor in Maine. Keeper Jaruel Marr, was Keeper at Hendricks Head lighthouse near Boothbay Harbor in Maine from 1866-1895. During a fierce March blizzard in 1875, blinding snow and gale force winds came up the Maine coastline. 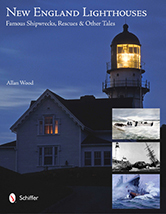 The captain of a small sailing vessel got caught in the rough seas as he was trying to make it ashore and could not see the lighthouse in the driving snow. The vessel ran aground on a rocky ledge about a half-mile from the lighthouse point. Keeper Jaruel Marr was watching from the station during the storm and noticed the vessel lodged on the rocks. He could see the figures of the survivors clinging to the rigging and watched helplessly as the icy waves continued to wash over them in a deathly grip. He anxiously debated as to whether he could launch his dory to help the doomed victims, but the ferocious high seas and gale force winds bashing against the rocky shoreline would have meant certain disaster for him. As darkness started to fall, the wind began to subside, allowing Keeper Marr and his wife to build and light a large bonfire for the victims of the wreck as a signal that help was waiting, if they miraculously could find a way to the shore. About an hour later, as he was feeding the fire, he noticed a strange large bundle floating in the waves. He ran to the boathouse for a boat hook and line, and asked his wife to assist him in holding the line as he waded into the freezing waters to retrieve it. He managed to resist the breaking waves and secure the bundle and himself safely on shore. Upon inspecting the bundle, he found it consisted of two small feather beds tied together, which seemed to contain something inside. When he ripped them apart he found a box with a crying baby girl. He grabbed the cold infant, and, with the line still tied around his waist, ran to the house and placed the infant near the fire to warm her. His wife quickly followed in and wrapped the baby in warm blankets to calm her down after the ordeal. With the baby being cared for, Keeper Marr rushed back to the shore to try and signal to the victims on the wreck, but it was too late. The seas had smashed the vessel to pieces with no survivors. The wreckage was starting to collect along the shore. The keeper looked for the box the infant was lying in and found some blankets, a locket and a message from the mother in the hopes that God would help her child. The infant survived the ordeal but all aboard the vessel had perished. The baby girl, later named Seaborn, was believed to have been later adopted by a doctor and his wife who were summer residents living nearby, as Keeper Marr and his wife had plenty of their own children at the time. This story has been disputed and believed to have had originated from a book published around 1900 called “Uncle Terry”, but ancestors of Keeper Marr believe and have written that it is actually true. 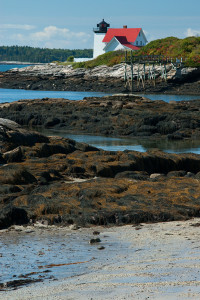 Hendricks Head lighthouse is located past Boothbay Harbor, in Southport, Maine. There is a small beach nearby to relax in and enjoy the views. 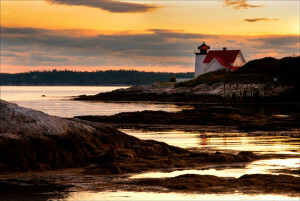 It’s one of the many attractions for tourists within Maine’s Boothbay Harbor region. 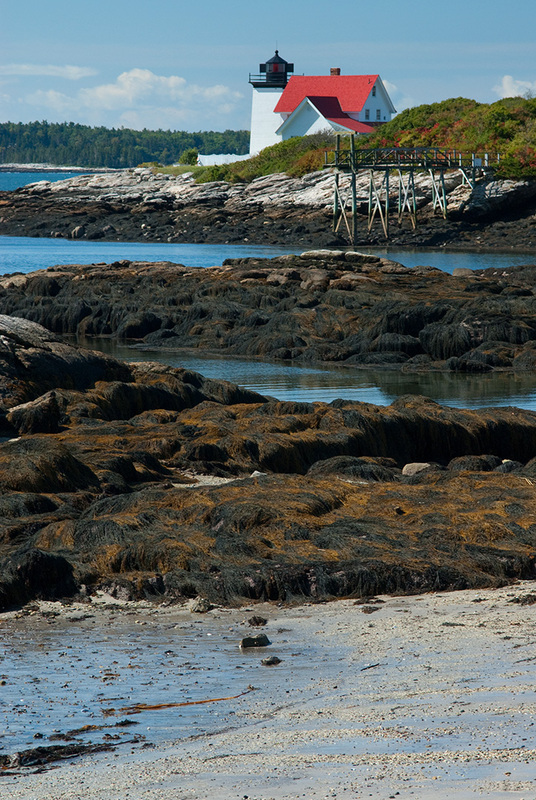 If you ever get up to Maine, this area is full of tiny coffee shops and restaurants, specialty shops, and plenty of boat tours to view Hendricks Head light and other lighthouses in the area.